It must frustrate ARM just how much attention is given to Intel in the ultra mobile space, especially considering the chip giant’s effectively non-existent market share. Since 2008 Intel has tried, year after year, to break into smartphones and tablets with very limited success. Despite having the IP and technical know-how to do so, it wasn’t until 2012 that we saw Intel act like a company with even a sliver of a chance. Today, things are finally starting to change. Intel’s 22nm SoC process and updated Atom microarchitecture look very competitive, and we’ll see the first tablet products based on them later this year - with phones following sometime in early 2014. As Intel is about to start acting like a competitor, ARM is starting to talk a lot more about its magic. We’ve had well over a decade of Intel sharing its beliefs with us, but this is ARM’s first attempt at doing the same. What will follow over the next few posts are a bunch of disclosures, some related some not, attempting to bring everyone up to speed on where ARM is today and where ARM will be in the near future. The best place to start is with ARM’s business model. In the PC industry, the concept of a fabless semiconductor manufacturer isn’t unusual. NVIDIA has always been one, and now AMD is one as well. Fabless semiconductors create all of the designs for their chips, but they’re physically manufactured at a foundry partner (e.g. TSMC, Global Foundries, Samsung). The fabless semi approach greatly helps reduce costs, but your designs are ultimately at the mercy of your foundry partner. Capacity, quality of process and timeline for process are more or less out of your control. Sometimes this is a non-issue, but other times it dramatically impacts your ability to bring products to market (e.g. quality control for early TSMC 40nm, timeline for GF 28nm or early capacity for TSMC 28nm). 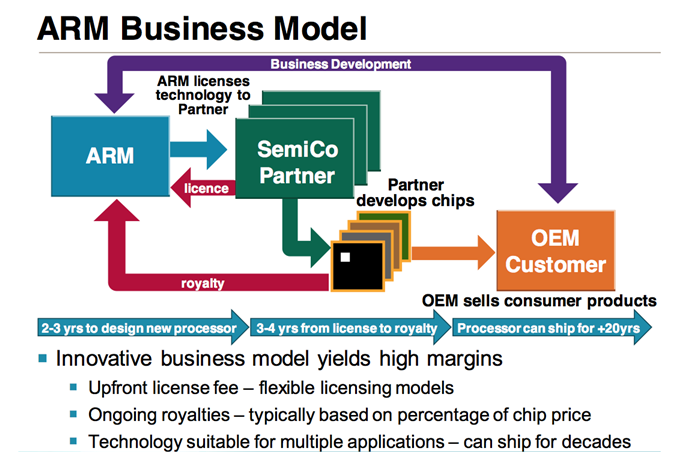 ARM goes one step beyond the fabless semi: it doesn’t even sell any chips into the marketplace. ARM instead, designs IP (instruction set architecture, microprocessor, graphics, interconnects) and licenses it to anyone who wants to use it. ARM’s customers will then take the IP they’ve licensed and design it into silicon. These customers can be fabless semiconductor companies or companies that own fabs. It’s a very unique business model, especially if you compare it to that of the market share leader in the PC silicon space (Intel). From Intel’s perspective, it made the mistake of licensing the x86 ISA early on in its life, but quickly retreated from that business. It instead builds its own architectures, designs them into chips for various markets, and manufactures the designs at its own foundries. Intel is a truly vertically integrated chip design and fabrication house. It’s a lot of work, but Intel is rewarded by having extremely high margins on all of its products. The ultra mobile world is very different, at least today. In the PC world, Intel drives platform definition and ends up being the biggest part of the BoM (Bill of Materials) as a result. In smartphones and tablets, the main applications processor is easily under 10% of the cost of the device. More often than not, we’re talking about low single digit percentages of the total BoM (e.g. $15 SoC for a $400 device, or 3.75%). Intel’s theory is that this will eventually change as silicon complexity increases inside ultra mobile devices, but until now (and likely for the near future) the market requires/enables a different sort of business model. 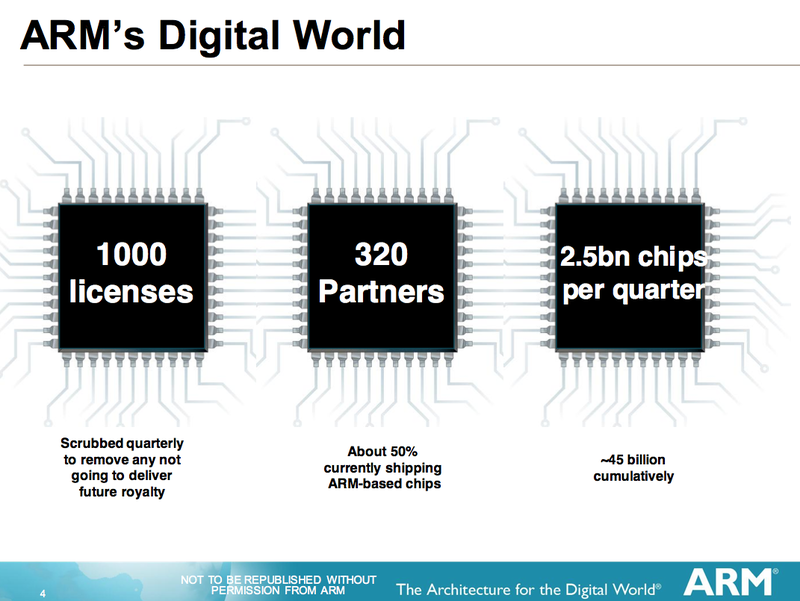 The ARM business model is incredibly simple to understand, it’s just different than what we’re used to in the PC space. At a high level, ARM offers three different types of licenses: POP, processor and architecture. A processor license is the license to use a microprocessor or GPU that ARM has designed. You can’t really change the design, but you get to implement it however you’d like. For example, Samsung’s Exynos 5 Octa implements four ARM Cortex A7 cores and four ARM Cortex A15 cores - these are processor licenses. ARM will provide guidelines as to how to implement these designs in silicon, but ultimately it’s up to you and your physical implementation teams to do so and get good frequency/power out of your design. A processor optimization pack (POP), takes a processor license to the next level. If you aren’t great at physical implementations, ARM will sell you an optimized processor design that you can take and manufacture at a specific foundry which will result in some degree of guaranteed performance. If you look at what happened with the Cortex A8, Apple and Samsung had their own physical implementations of the core that resulted in better frequency/power than a lot of other designs. Apple and Samsung had access to Intrinsity who hardened the Cortex A8 design, but not all companies had the bandwidth/budget to do the same. POPs are ARM’s equivalent solution for those customers who need very good implementations but can’t do so by themselves. POPs are available for various processor/foundry/process node combinations. 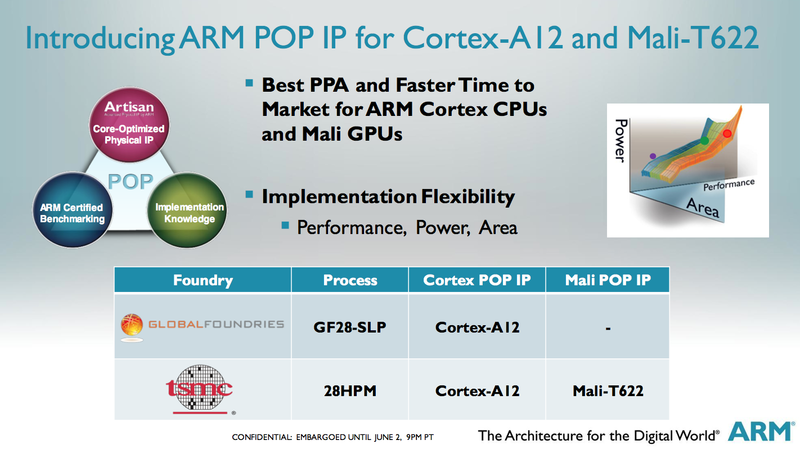 For example, ARM offers a 28nm HPM POP at TSMC for the Cortex A12. The final option is an architecture license. Here, ARM would license you one of its architectures (e.g. ARMv7, ARMv8) and you’re free to take that architecture and implement it however you’d like. This is what Qualcomm does to build Krait, and what Apple did to build Swift. These microprocessors are ISA compatible with ARM’s Cortex A15 for example, but they are their own implementations of the ARM ISA. Here you basically get a book and a bunch of tests to verify compliance with the ARM ISA you’re implementing. ARM will offer some support to help you with your design, but it’s ultimately up to you to design, implement and validate your own microprocessor design. In terms of numbers, ARM has around 1000 licenses in the market spread across 320 licensees/partners. Of those 320 licensees, only 15 of them have architecture licenses. So basically ARM is like an author who choose to work with a bunch of different publishers? "It amazes me how dominant they are, though, in the mobile processor industry, all without having to manufacture chips themselves. 45 billion chips... wow." ...nd the mobile processor industry into the vast all-purpose market (street lights, lifts, automatic turnstiles etc). These industries strictly specified the maximum power output the chips could be capable of (used to be 700mW) and ARM designed within those parameters. As such their entire R&D/Logistics/Marketing focus has been perfectly suited to the battery-power-constrained mobile industry. Intel, on the other hand, after decades of dictating to the booming desktop industry with its faster/more cores/larger plants philosophy, is only just coming to grips with the power efficiency and discipline required to compete with ARM in the rapidly growing mobile sector. I could not follow the sense of your statement "From Intel’s perspective, it made the mistake of licensing the x86 ISA early on in its life, but quickly retreated from that business." I thought IBM required that Intel license X86 to competitors as a pre condition of IBM's selection of Intel's 8086 for the IBM PC. Did Intel made a boo boo letting IBM use the 8086 in the IBM PC? It was reported that Intel's selection of x86 license partners was driven by the dual criteria that the partner must be acceptable to IBM and also likely incompetent to exploit the benefits of the license. In retrospect, their selection of partners achieved these goals. What was Intel's licensing mistake? AMD and Intel cross license x86. It's not fair to claim x86 is Intel's thing along, given how much stuff Intel has to license from AMD for it-heck, the most obvious is 64-bit. The updated ISA is AMD's design, and Intel started using it a few years later. "At that time their (AMD's) CPU's were faster and they were eating away Intel's business. Intel had since then made a new architecture and did not license it to AMD. Consequently AMD fell behind and had not recovered since."